I would like to thank Mr. Subrata Ray-Vice President & Mr. Shib Shankar Bhattacharyya – Head (Sales & Marketing) - and to my Head of Department, IIT Roorkee Dr. Santosh N.Rangnekar for providing me this opportunity for this corporate exposure which is a great learning experience during my MBA. 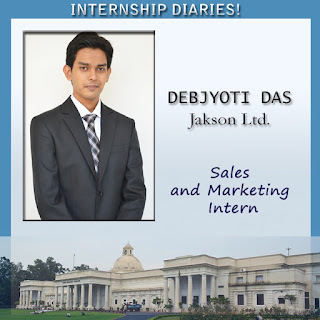 I am extremely thankful to Jakson Ltd. for giving me the opportunity to undertake this project on Sales and Market Research for Diesel Generators in Kolkata, during my summer internship I would like to express my sincere gratitude to my project guide Mr.Siddhartha Ghosh (Team Lead –Sales and Marketing) for his overall support, valuable guidance, astute judgments and an eye of perfection without which this project would not have been in the present shape. The main objective of this project report is to perform a detailed survey of the current scenario of the Diesel Generator market for Jakson Ltd. in Kolkata. These surveying and the sample generation has been done during the Summer Internship from May 2015 to July 2015.The project have focused on the company profile, its goals and objectives. The report also contains thorough analysis of the customer reviews which have been gathered from regular field survey and telephonic interviews in Kolkata region. The Sample size that has been taken is 500 and above which gives more accuracy to the researches that have been made. All the samples are from geographical locations of Kolkata, West Bengal. Moreover, the report also gives a brief idea about the company marketing strategies and various branding and promotion techniques. It shows the expected growth rate of the Jakson Ltd. in the market. The 4P’s and SWOT analysis of the company is also shown in the report. This report is beneficial for market research of Jakson Ltd., Kolkata.